View this article on Book of Mormon Central. Cover image via LDS.org. Not content with attributing sole authorship of the Book of Mormon to Joseph Smith, early anti-Mormons quickly looked to other individuals as potential co-conspirators and to other nineteenth century texts as possible sources of plagiarism. The first and most widespread theory among skeptics was what is today sometimes called the Spalding-Rigdon Theory for Book of Mormon authorship. According to this theory, Sidney Rigdon secretly gave Joseph Smith a copy of an unpublished manuscript written by a certain Solomon Spalding (or Spaulding). Joseph then, the theory goes, palmed off this manuscript with his own additions as the Book of Mormon. 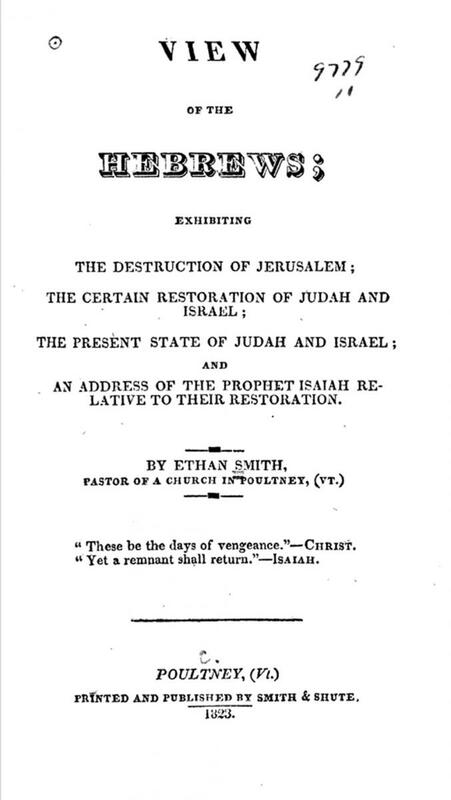 The title page of Ethan Smith’s View of the Hebrews. Arguments that the Book of Mormon was derived from other nineteenth century books do not adequately explain its features—for example, its astounding narrative complexity, literary elegance, profound theology, and authentic ancient characteristics. Nor do such arguments account for the circumstances of its coming forth, including its rapid dictation, lack of revisions, and the testimonies of those who handled the plates and beheld the angel. The weight of the combined evidence affirms that the Book of Mormon is unlike any other nineteenth century work, and is an authentic ancient text. The testimony of the Holy Ghost given to sincere seekers ratifies this truth (Moroni 10:4–5). John W. Welch, “Finding Answers to B. H. Roberts’s Questions and An Unparallel,” FARMS Preliminary Report (Provo, UT: FARMS, 1985). Louis Midgley, Who Really Wrote the Book of Mormon? The Critics and Their Theories,” in Book of Mormon Authorship Revisited: The Evidence for Ancient Origins, ed. Noel B. Reynolds (Provo, UT: FARMS, 1997), 101–140. John Gee, “The Wrong Type of Book,” in Echoes and Evidences of the Book of Mormon, ed. Donald W. Parry, Daniel C. Peterson, and John W. Welch (Provo, UT: FARMS, 2002), 307–330. Daniel C. Peterson, “Editor’s Introduction: ‘In the Hope That Something Will Stick’: Changing Explanations for the Book of Mormon,” FARMS Review 16, no. 2 (2004): xi–xxxv. Matthew Roper, “The Mythical ‘Manuscript Found’,” FARMS Review 17, no. 2 (2005): 7–140. Benjamin L. McGuire, “The Late War Against the Book of Mormon,” Interpreter: A Journal of Mormon Scripture 7 (2013): 323–355. 1. Alexander Campbell, “Delusions,” Millennial Harbinger 2, no. 2 (February 7, 1831): 93, emphasis in original. The mentioning of Joseph Smith as the “author” of the Book of Mormon refers to the Title Page of the 1830 edition, which names Joseph Smith as the “Author and Proprietor” of the book. This was done merely to comply with copyright law. 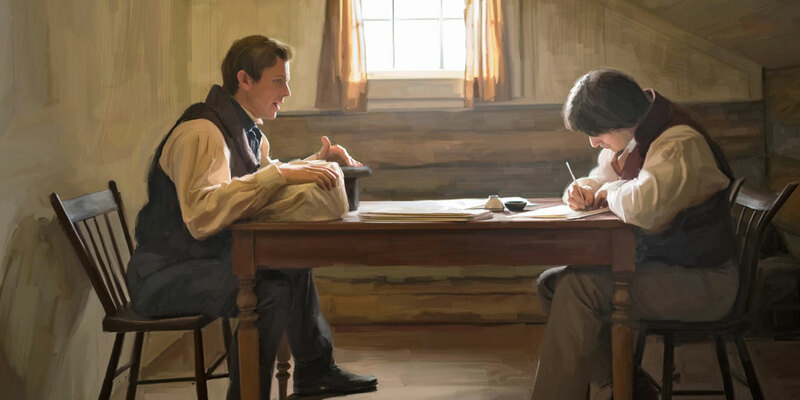 From the beginning, Joseph Smith made it clear that he was the translator of the book, not its author in the mundane sense. See Kenneth H. Godfrey, “Not Enough Trouble,” Dialogue: A Journal of Mormon Thought 19, no. 3 (Fall 1986): 143. See further Miriam A. Smith and John W. Welch, ”Joseph Smith: ‘Author and Proprietor’,” in Reexploring the Book of Mormon, ed. John W. Welch (Provo, UT: FARMS, 1992), 154–157; Royal Skousen, Analysis of Textual Variants of the Book of Mormon, Part One: 1 Nephi – 2 Nephi 10 (Provo, UT: FARMS, 2004), 35–36. 2.Daniel C. Peterson, “Editor’s Introduction: ‘In the Hope That Something Will Stick’: Changing Explanations for the Book of Mormon,” FARMS Review 16, no. 2 (2004): xv, quoting early critical sources. 3.E. D. Howe, Mormonism Unvailed (Painesville, OH: E. D. Howe, 1834), esp. 278–290. 4.See for instance Parley P. Pratt, Mormonism Unveiled (New York, NY: O. Pratt and E. Fordham, 1838), esp. 40–42; Benjamin Winchester, Plain Facts, Shewing the Origin of the Spaulding Story (Bedford: C. B. Merry, 1841). 5.The manuscript was published by The Reorganized Church of Jesus Christ of Latter Day Saints in 1885 and The Church of Jesus Christ of Latter-day Saints in 1886. 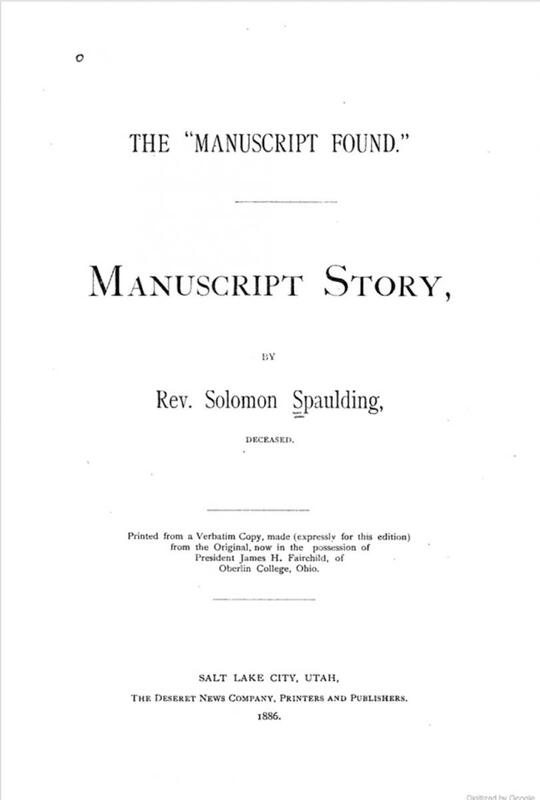 See Solomon Spaulding, The “Manuscript Found”: A Verbatim Copy of the Original (Lamoni, Iowa: The Reorganized Church of Jesus Christ of Latter Day Saints, 1885); The “Manuscript Found”: Manuscript Story (Salt Lake City, UT: Deseret News, 1886). A modern facsimile edition of the manuscript was published by Brigham Young University in 1996. 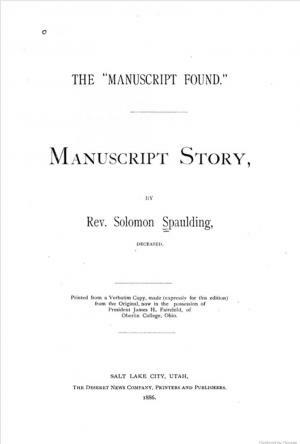 See Kent P. Jackson, ed., Manuscript Found: The Complete Original “Spaulding Manuscript” (Provo, UT: Religious Studies Center, Brigham Young University, 1996). 6.Fawn M. Brodie, No Man Knows My History: The Life of Joseph Smith, 2nd ed. (New York, NY: Vintage, 1971), 442–456. 7.See for instance Wayne L. Cowdrey, Howard A. Davis, and Arthur Vanick, Who Really Wrote the Book of Mormon? The Spalding Enigma (St. Louis, MO: Concordia, 2005); Matthew L. Jockers, Daniela M. Witten, and Craig S. Criddle. “Reassessing authorship of the Book of Mormon using delta and nearest shrunken centroid classification,” Literary and Linguistic Computing 23, no. 4 (2008): 465–491. For an exhaustive review and rebuttal of these recent attempts to revive the Spalding-Rigdon Theory, see Matthew Roper, “The Mythical ‘Manuscript Found’,” FARMS Review 17, no. 2 (2005): 7–140; “Myth, Memory, and ‘Manuscript Found’,” FARMS Review 21, no. 2 (2009): 179–223; Paul J. Fields, G. Bruce Schallje, and Matthew Roper, “Examining a Misapplication of Nearest Shrunken Centroid Classification to Investigate Book of Mormon Authorship,” Mormon Studies Review 23, no. 1 (2011): 87–111; Matthew Roper and Paul J. Fields, “The Historical Case against Sidney Rigdon’s Authorship of the Book of Mormon,” Mormon Studies Review 23, no. 1 (2011): 113–125. 8.Lester E. Bush, Jr., “The Spalding Theory Then and Now,” Dialogue: A Journal of Mormon Thought 10, no. 4 (Autumn 1977): 57. 9.Bush, “The Spalding Theory Then and Now,” 62. 10.E. D. Howe, Mormonism Unvailed, ed. Dan Vogel (Salt Lake City, UT: Signature Books, 2015), 412. 11.I. Woodbridge Riley, The Founder of Mormonism (New York, NY: Dood, Mead & Company, 1902), esp. 107–138. 12.Ethan Smith, View of the Hebrews (Poultney, VT: Smith & Shute, 1823). 13.Smith, View of the Hebrews, esp. 64–129. 14.Riley, The Founder of Mormonism, 124; Brodie, No Man Knows My History, 46–49; David Persuitte, Joseph Smith and the Origins of the Book of Mormon, 2nd ed. (Jefferson, NC: McFarland, 2000). 15.There is no credible evidence that Elder Roberts ever lost his faith in the Book of Mormon. See the discussions in Truman G. Madsen, “B. H. Roberts and the Book of Mormon,” BYU Studies 19, no. 4 (Summer 1979): 427–444; “B. H. Roberts after Fifty Years: Still Witnessing for the Book of Mormon,” Ensign, December 1983, 10–19; Truman G. Madsen and John W. Welch, “Did B.H. Roberts Lose Faith in the Book of Mormon?” FARMS Preliminary Reports (Provo, UT: FARMS, 1985); John W. Welch, “B. H. Roberts: Seeker after Truth,” Ensign, March 1986, 56–62; Daniel C. Peterson, “Yet More Abuse of B. H. Roberts,” FARMS Review of Books 9, no. 1 (1997): 69–86. 16.B. H. Roberts, Studies of the Book of Mormon, ed. Brigham D. Madsen (Urbana, IL. : University of Illinois Press, 1985), 321–344. 17.A point admitted, but quickly downplayed, by Brodie, No Man Knows My History, 47. 18.“From Priest’s American Antiquities,” Times and Seasons (June 1, 1842): 813–814. 19.Bruce D. Blumell, “I Have a Question,” Ensign, September 1976. 20.John W. Welch, “Finding Answers to B. H. Roberts’s Questions and An Unparallel,” FARMS Preliminary Report(Provo, UT: FARMS, 1985); John Gee, “The Wrong Type of Book,” in Echoes and Evidences of the Book of Mormon, ed. Donald W. Parry, Daniel C. Peterson, and John W. Welch (Provo, UT: FARMS, 2002), 307–330. 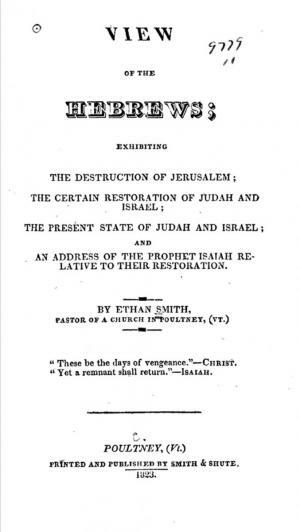 21.Ethan Smith, View of the Hebrews: 1825 Second Edition, ed. Charles D. Tate, Jr. (Provo, Utah: Religious Studies Center, Brigham Young University, 1996). 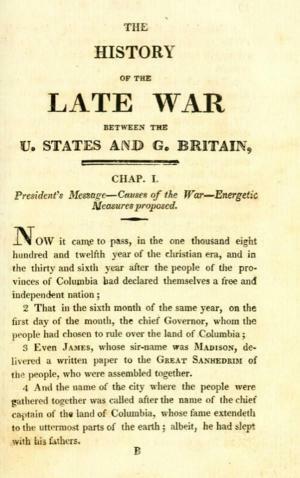 23.See “A Comparison of The Book of Mormon and The Late War Between the United States and Great Britain,” online at https://wordtree.org/thelatewar/. 24.“A Comparison of The Book of Mormon and The Late War Between the United States and Great Britain,” online at https://wordtree.org/thelatewar/. 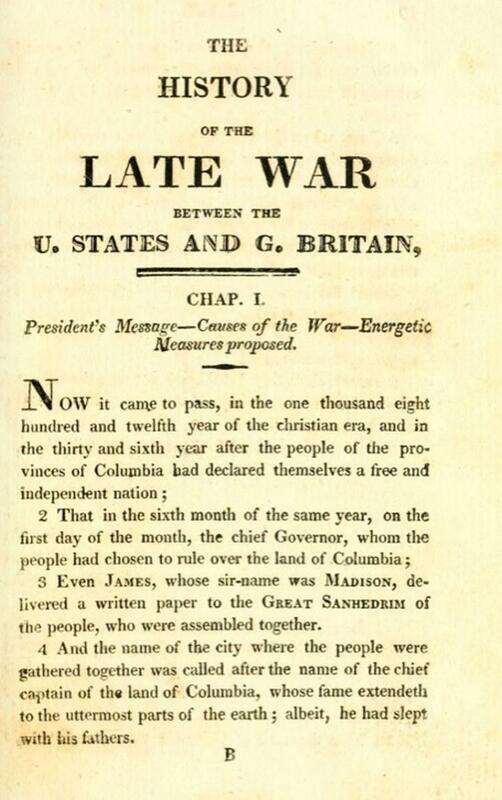 The book itself can be read online at the Book of Mormon Central archive at https://archive.bookofmormoncentral.org/content/late-war-between-united-states-and-great-britain-june-1812-february-1815. 25.See Matthew Roper and Paul Fields, “Scriptural Style in Early Nineteenth Century American Literature,” 2014 FairMormon Conference, online at fairmormon.org. 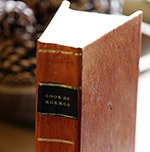 26.See “Was the Book of Mormon influenced by the language and themes of ‘The Late War’ by Gilbert Hunt?” online at fairmormon.org. 27.Benjamin L. McGuire, “The Late War Against the Book of Mormon,” Interpreter: A Journal of Mormon Scripture 7 (2013): 354–355. 28.Eran Shalev documents the deliberate attempt by early American writers to draw their readers into “the narratives, language, and ordinances of biblical times” by capturing biblical idiom in their texts. Eran Shalev, American Zion: The Old Testament as a Political Text from the Revolution to the Civil War (New Haven, CT: Yale University Press, 2013), 2. Shalev also discussed the position of the Book of Mormon in this broader literary culture and wondered if “the Book of Mormon’s biblical language . . . catered to audiences’ need to hear prophecy in the language that was universally accepted as suitable and even necessary for divine pronouncements.” Shalev, American Zion, 84–117, quote at 114. For another view, see Stanford Carmack, “Is the Book of Mormon a Pseudo-Archaic Text?” Interpreter: A Journal of Latter-day Saint Faith and Scholarship 28 (2018): 177-232. 29.John A. Widtsoe, “Preface,” in A New Witness for Christ in America: The Book of Mormon, ed. Francis W. Kirkham (Independence, MO: Zion’s Printing Company, 1951), 2: vii–viii. 30.This point has been stressed more recently by Daniel C. Peterson: “The fact is, the falsehood of the Book of Mormon has no more been demonstrated to the satisfaction of all serious observers than has its truth. But what is even more striking is that critics of the Book of Mormon have not yet been able even to formulate a coherent counterexplanation, a unified global theory, with which to challenge the traditional story of the book’s origins.” Peterson, “Editor’s Introduction,” xxi. 31.Jeffrey R. Holland, “Safety for the Soul,” Ensign, November 2009, 89. 32.Dale Morgan to Juanita Brooks, December 15, 1945, published in John Phillip Walker, Dale Morgan on Early Mormonism (Salt Lake City, UT: Signature Books, 1986), 87, emphasis in original.